Welcome to the Jblog textbook series! It’s great news that your child is learning Japanese at school this year! Learning to understand the language and customs of another culture is an important skill for your child’s future. It has the power to give students a new perspective on their own community and culture, offers an alternative tool for expressing their thoughts and feelings, and can be a passport to new opportunities on a global scale. In future opportunities yet to be created by the next generation. Some of you may have limited experience in learning Japanese. This is a great opportunity for you to support your child’s education while learning something new yourself. The following articles are designed to help you better understand the Japanese program your child is about to undertake. They are also available as PDFs if you would prefer to download the content for future reference. The textbook is designed to be your child’s main resource for learning Japanese. The content is presented in such a way that students are able to teach themselves without the help of their teacher. Their teacher will extend the material covered in the textbook with additional activities in the classroom. Let’s look at the key features of the textbook and how they can help your child. You will find script tables in the inside covers of the textbook: the hiragana table in the front and the katakana table at the back. A script is how we describe written language systems. In English, we use capital letters, lower case letters and cursive letters. Japanese uses three main scripts: hiragana, katakana and kanji. Your child should refer to the hiragana and katakana tables when they are practising reading and writing. If you look closely, you will notice that they are numbered with the stroke order to write each letter. You will find the index at the back of the textbook. The English to Japanese index can be found on pages 106 to 110, with words listed in alphabetical order. You can look up a word in English and see the Japanese translation written next to it in Japanese script. Above each letter in the Japanese word is romaji. Romaji shows how we pronounce the word by using the English alphabet phonetically. This will support your child as they master reading Japanese scripts. The Japanese to English index can be found on pages 110 to 114. The words are listed in the hiragana order, which is different to the English alphabetical order. The kanji index can be found on pages 114 to 116. The kanji words are listed in the order they appear in the textbook by chapter. The kanji index lists how to write the kanji using the correct stroke order, the English meaning of the word, and how it is pronounced and written in hiragana. Each page is numbered with the chapter number followed by page number, for example, 1-3 is Chapter 1 Page 3. These numbers appear on the side panels of each page. Each chapter begins with a large photograph of an aspect of Japanese culture. These images will help your child develop an understanding of the many facets of Japanese modern society, for example, traditional temples and shrines, modern skyscrapers, martial arts and school life. Students will learn through exposure to such images that Japanese culture is more than the stereotypes they may be familiar with. 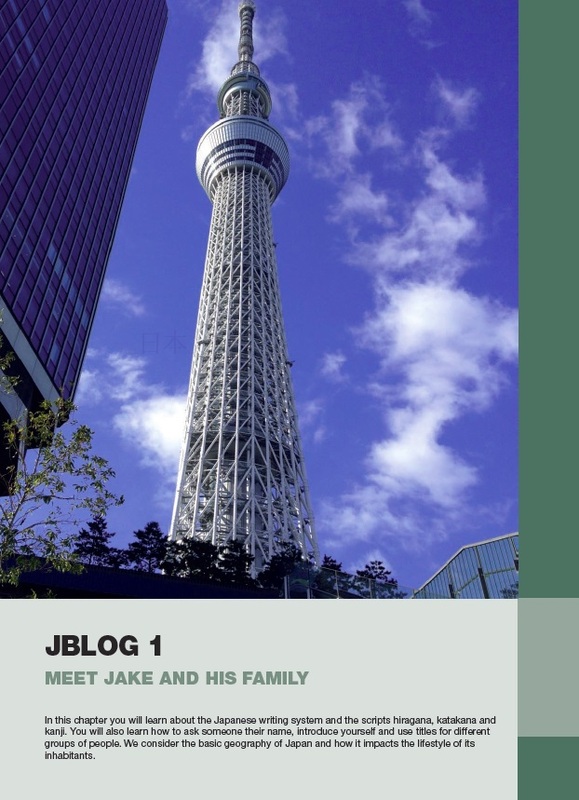 Jblog is a weblog that introduces the cultural background of the chapter. It is written from the perspective of the main character, Jake. His family, including his mum and younger sister, have moved to Tokyo with his father’s role. The blog includes detailed facts to keep even our most gifted students engaged with new insights. The blog has a black side panel that includes the focus words for the blog. These words are listed in Japanese script and English. The pronunciation of each word is listed in the body of the text. If a word is repeated several times in the text, then the romaji above the word with the pronunciation occurs on the word’s first appearance only. When new phrases or grammatical structures are introduced, they are presented as a scaffold. A scaffold is a table that explains what each part of the sentence means and the order the words need to appear in in Japanese. This is called syntax. This section provides challenges at three levels of difficulty based on the ski run rating system of green for beginner, blue for intermediate, and black for advanced. Students are encouraged to return to these challenges and try more difficult levels as their confidence with the content grows. This section is based on an Agony Aunt column. A reader sends in a problem they are having understanding an aspect of Japanese language or culture. For example, why is my locker number 4 considered unlucky? The Senpai is the mentor who explains the Japanese perspective to the reader. This section will develop your child’s ability to think laterally and consider other perspectives. It will promote a deeper understanding of how Japanese works as a language system, and how the Japanese culture influences the way people act. This section is written from the perspective of Jake’s younger sister, Lucy. She studied Japanese in Australia prior to the move and offers her advice to Jake. Lucy models the language studied in each chapter in more contextualised texts. For example, she creates palm cards with phrases to use at a birthday party. Although you may not know Japanese yet, your role as a supportive parent can make a huge difference to your child’s achievement and enjoyment of the course. Academic research shows that parents have a major influence on their child’s education – be it positive or negative. Have your child study in the kitchen or a family common area where you are, rather than alone in their bedroom. You will find there are fewer distractions in a common area than in a room with access to the Internet or a mobile phone. Busy yourself with making dinner or catching up on your own emails. Just knowing you are in the room may be enough to keep them on task. Have your child quiz you on one fact that they learned that week. For example, what Japanese sport was banned by the Allies in 1945? (The answer can be found on page 18 of the Jblog Textbook 1, in case you are curious.) Or open the textbook to the chapter they are studying and quiz the family on interesting details. The more your child talks about their learning, the higher the chance of that learning being embedded in their long-term memory. Test your child on their flashcards or vocabulary lists. Vocabulary tables appear in the textbook in romaji (the English pronunciation), so you can check your child’s work even if you’re not 100% sure of the accent. Allow your child to teach you some Japanese. When you teach someone else, your own understanding of the content deepens. You will become a valuable role model for your child as you demonstrate how you learn. Do you need to say new words out aloud or write them down to remember them? Does rhyme or song help you? Can you think of any stories that will help you remember the words? Your child will be learning along with you and will enjoy the role reversal of being the person in charge! If your child’s school uses class sets of the textbook (i.e., students share textbooks that are kept in the classroom), you may like to consider purchasing your own copy. This will enable you to help them study at home at their own pace, rather than as a group in class. Some students benefit from having more time to read over material and may feel rushed or distracted in class. Other students will want to direct their own learning at a faster pace than their peers and will benefit from the challenge of extension work. You can order your own copy via this website or by emailing Manten Resources. Why is my child learning Japanese anyway? There are many excellent reasons for your child to learn a second language. If you have never studied a second language, this is a chance for you to ensure that your child gets that opportunity and all the benefits that this provides. Interestingly, the most commonly cited regrets by adults regarding past schooling are around learning a second language and a musical instrument. Prepares your child for their role as a global citizen in our increasingly multicultural society. The lack of time difference enabling online interactions in real time via videoconferencing etc. The opportunities for further study in Japan in fields such as technology, science, design and cinema. All of the above reasons are important, but what drives my own personal passion for Japanese is the potential for change that it offers: previous Japanese students have, due to their Japanese skills, stood out amongst a sea of university and high school graduates, won internships at Google Tokyo, brokered investment deals, studied animation, and trained Japanese sporting teams in rugby, cricket and AFL. All of their individual life choices were enhanced by their Japanese studies, regardless of the level of fluency they attained. I was educated in a small coastal town of Australia with little experience of multiculturalism. My own opportunities to learn a second language were limited until university. I was an unlikely candidate for Japanese study as my own grandfather had been interned in a Japanese Prisoner of War camp in WW2. Yet within 6 months of beginning my study of Japanese, I knew that it would change my life. I discovered another aspect of my personality as I took on a new language and new cultural mannerisms, such as bowing and eating with chopsticks. This learning took me to Japan where I saw life through a new lens. I climbed Mt Fuji at dawn, I rode through ancient streets aloft a festival shrine, I listened to the stories of Hiroshima survivors. What I gained the most though was a sense of hope for future generations. The youth of today often struggle with anxiety about their future in a world of increasing uncertainty. My message to them is my own story, that in just two generations, two cultures that were once at war could become so close. Such an outcome inspires me to believe that a greater understanding of our different cultures and languages will eventually help us bridge the gap between the nations of the world. This hope continues with your child now. Many people worry about learning Japanese because of the scripts used to write the language. It doesn’t look like English so many falsely assume that it is a more difficult language to learn. Before we briefly explain what the scripts are, it may be reassuring to note that Japanese is a phonetic language, which means it is written as it is pronounced. This means it is a lot easier to spell in Japanese than it is in English! Students who have struggled with English spelling will experience a new sense of confidence in their writing due to the phonetic consistency of the Japanese language. Japanese uses three scripts, namely hiragana, katakana and kanji. English uses the alphabet but this can be written as lower case letters, capital letters and cursive letters. At first glance, it may appear that many of the Japanese letters look similar. But have you ever considered how similar the English alphabet looks to a non-native speaker? There are many letters in English that are simply a combination of a circle and a straight line: o, p, q, b, d, and a.
Japanese is not a tonal language which means that pronunciation is straight forward. Most people can develop a good Japanese accent quite quickly. Japanese grammar is also very consistent and easy to master. For example, the four tenses for the verb to eat are simply tabemasu, tabemasen, tabemashita, tabemasen deshita. Only the underlined part changes. In English, however, it completely changes from I eat, to I ate, and does not follow a set pattern across different verbs like Japanese does. Hiragana is the first script your child will learn. It has soft, slightly curved letters. Katakana is used to write words that are derived from outside Japan, for example, your name. It has letters that are drawn with straight, sharper lines or dots. Kanji are simplified pictures of words. For example, the number 2 is written as two straight lines二. Kanji originated in China but have been simplified slightly for Japanese. Of the three scripts, Kanji are the most difficult to learn but they are usually the most popular. Students tend to enjoy the challenge of writing what appears to non-Japanese speakers as a “secret language”. There are many apps your child can download to practice this learning. You can ask your school for a list of preferred apps if you are interested in this type of learning support for your child.